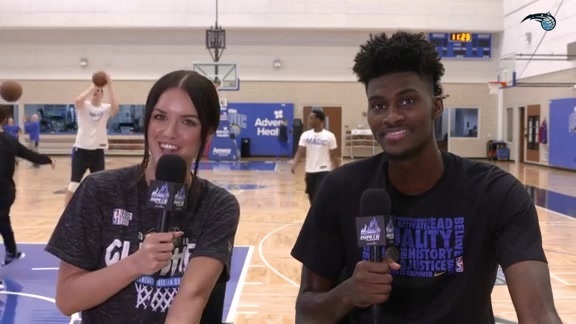 ORLANDO – Jonathan Isaac is a few days shy of his 21st birthday and still incredibly raw as a player, but he is being looked at by some of his Orlando Magic teammates as a potential X-factor for this season. Rather than seeing that as some sort of burden or a source of pressure, the long-armed and towering Isaac welcomes it the same way he does when asked to check the other team’s best scorer. After all, how many NBA players are talented, versatile and trustworthy enough to guard superstars LeBron James and Anthony Davis in their rookie seasons? Isaac possesses that kind of stratospheric ceiling as a player and it’s just one of the many reasons that some with the Magic feel like he could be the forward to potentially push the franchise over the hump this season. For Isaac to do just that he, first, must prove that he can stay healthier than he did during an injury-marred rookie season. Secondly, he will need to show tremendous improvements offensively by playing with the same confidence and assertiveness that he flashed in the NBA Summer League when he often resembled the best player on the floor. Do those things well, combined with being a suffocating defender who can smother wing players and big men on the inside, and Isaac could mean a world of difference to a Magic squad looking for its first winning season since 2012. At least that’s the unflinching opinion of Magic shooting guard Evan Fournier, who has suffered through four consecutive losing campaigns in Orlando and is eager to see the franchise get back into contention. 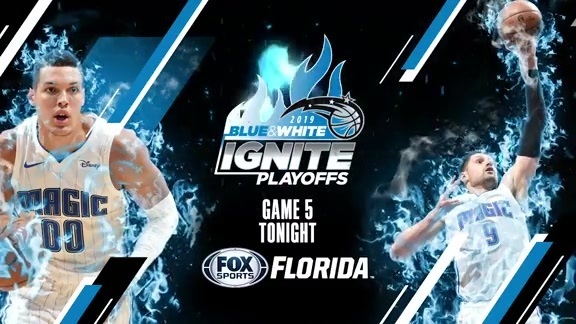 The praise for Isaac extends to new Magic head coach Steve Clifford, who never got to see Isaac play in person last season as the rookie missed all four games against the Charlotte Hornets – Clifford’s previous employer – because of ankle injuries. Clifford was on hand for Isaac’s three stellar Summer League performances and he’s talked with the young forward about doing many of those same things that should make him a key cog for the Magic. That statement alone says plenty about the work that Isaac put in over the summer to vastly improve his body. After being the No. 6 pick of the 2017 NBA Draft, Isaac played most of last season at a spindly 211 pounds. Work in the weight room and with a Magic nutritionist has since helped him bulk up to 226 pounds and he is now within range of his goal of 230 pounds. Also, after sprouting from 6-10 to 6-11 as a rookie, Isaac has continued to grow upward to a territory where he isn’t quite as comfortable. Throughout his summer pick-up games and the early stages of training camp Isaac said he’s witnessed how his improved strength has made him an even more effective player. Now, he doesn’t get knocked off course as much on cuts to the rim and he’s better able to hold his ground when facing bigger, more mature players such as last season when he checked the burly James and the dynamic Davis in early-season Magic victories. ``One of my first games last year I had to guard LeBron because (Aaron Gordon) was out and that was an exciting game for me because (James) is so strong and aggressive,’’ said Isaac, who limited the four-time MVP to 22 points and two assists in 31 minutes. ``I’d also say Anthony Davis (was a difficult matchup) because of his length and his strength. ``Being able to defend, being able to take bumps and stay in front of guys, I’d say everywhere on the court I’ve seen improvements with more strength in my body,’’ he added. Undoubtedly, foes are going to sag off Isaac on the offensive end of the floor, daring him to shoot the ball from the perimeter. Last season, he shot just 37.9 percent from the floor and only 34.8 percent from 3-point range, but he did make a career-best three threes in what proved to be his final game on April 1 in Atlanta. All of those numbers can be thrown out, Isaac stressed, because he is in a much better place now with his offensive game following an offseason in which he gained more confidence in his re-tooled shot. Also, Clifford has shown his confidence in Isaac’s blossoming skills by giving him a significant role in the team’s offense. ``I know (Clifford) expects me to be aggressive and expects me to shoot the ball when I’m open,’’ Isaac said. ``As our offense is, the (power forwards) and the (centers) are creating a lot of the action, so it’s about me being aggressive and picking my spots and scoring in the flow of the offense. Then, there’s this: Isaac also feels that he will be a significantly better defender than he showed last season. Considering that he blocked two-or-more shots in a game nine times and registered multiple-steal games 11 times as a raw rookie, Isaac’s steady improvement could make scorers around the NBA shudder when facing the Magic this season.